Parsons: Disliking "graven images," he gives it a "C", 55/100. Michael5000: Parsons and I share a healthy dislike of the kind of elaborate-national-seal-on-a-flag frimframery that stinks up some national flags (and a great many U.S. state flags). I can't hold with him when he calls simple one-color shapes "graven images," though. 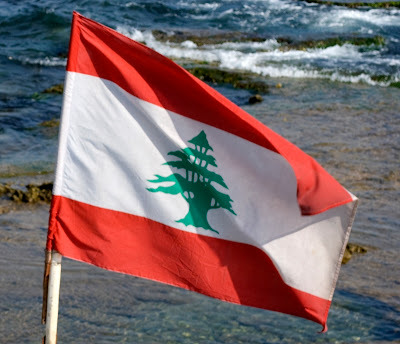 The Lebanese flag is a red-white-red tricolor with a wide center stripe and a green shape in the center; it passes the Betsy Ross test with (to use the unintentional pun for about the thousandth time) flying colors. It's simple, dignified, and in the top ranks of recognizability. I like it. Parsons: Disliking the "weapons" on Lesotho's flag, he gives it a "D", 55/100. 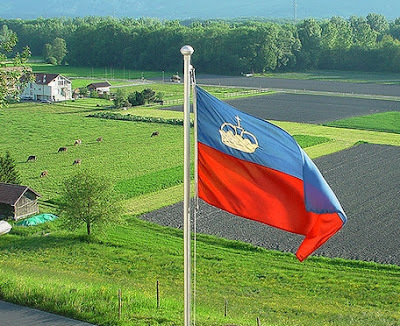 The small mountain kingdom of Lesotho is marking its 40th anniversary of independence from the United Kingdom by flying a new more peaceful flag. The military emblem of a shield, spear and knobkerrie is replaced by a traditional cone-shaped hat on the blue, white and green flag. The hat worn by indigenous Basotho people was on the first independence flag but was replaced after a coup. 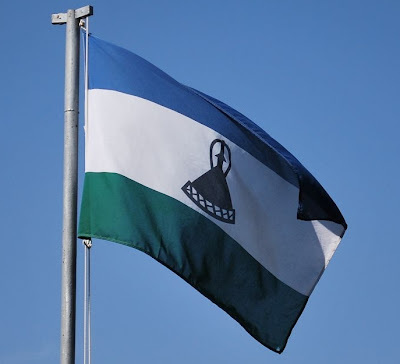 Lesotho says its new flag shows it "at peace with itself and its neighbours". Probably they took Parsons' criticism to heart. We flag critics have a lot of clout. Parsons: It's "too busy" and represents "plagiarism," but "at least an improvement on the US flag." He gives it a "B", 74/100. Michael5000: Hmm, "plagiarism." Y'all know about Liberia, right? American abolitionists buy the freedom of a bunch of slaves and literally send them back to Africa, thus dislocating not only the freedmen from their North American homeland but also the African folks who happened to be living on the territory chosen for the project. Good thinking, guys! The repercussions are still in full swing. So, "Liberia," liberty, freed slaves. Capital: Monrovia, after U.S. President Monroe, under whose tenure the whole scheme was hatched. And the flag is, yes derived from the United States'. Under the circumstances, "plagiarism" seems a little hard. At least an improvement on the US flag? Hard to argue with that. Parsons: Asks "did you even try?" but calls it "original" and "simple" and gives it a "B", 70/100. Michael5000: Green! The color of Islam! And Libya is not shy about announcing itself as an Islamic country. Kind of weird, isn't it. They don't quite look like flags, but like a placeholder for some more conventional flag to be determined at a later date. 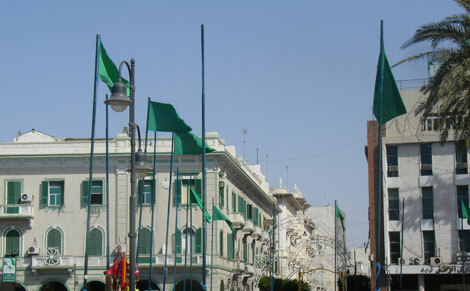 Which leads to the main problem with the Libyan flag: it's quite distinctive when you are looking at it on a table of "Flags of the World" or whatever. Whereas, if you see it in real life, it's loses any sense of distinctiveness. "Is that a flag, or just a piece of green fabric," you ask. I have a set of sheets that are essentially Libyan flags, but no inferences regarding my attitude toward the North African state should be made based on this fact. Parsons: Without comment, he consigns it to a "C", 56/100. Lesotho's flag is pretty cool. I still stay Lebanon's is the most Christmassy, and also fairly awesome. Love those cedar trees! 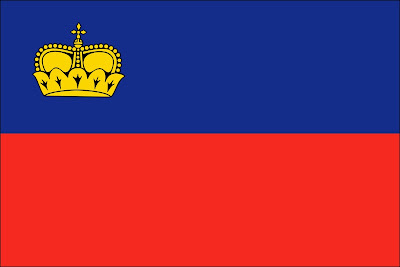 And for the record, Rebel and Liechtenstein are on very poor diplomatic terms. Is this what they call grade inflation professor Handley. 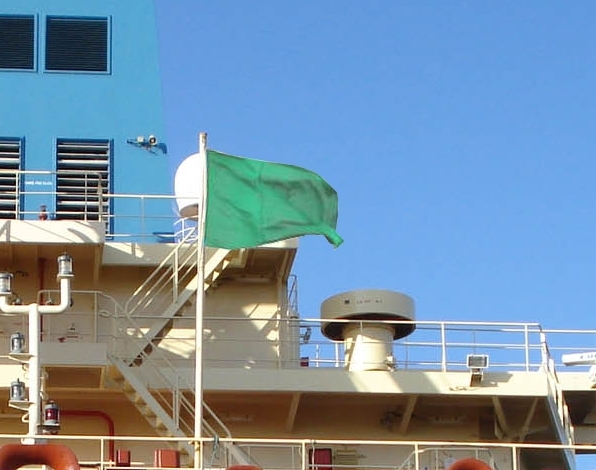 A uni-color flag deserves an "f". Seriously... And maybe I'm missing something, but it seems to me that lesotho's flag now looks way more violent- like someone punctured with an arrow and giant push pin.